In their most lopsided game in all of 2010, the Maryland Terrapins dismantled the Virginia Tech Hokies on their home turf by a score of 7-0. However, after Virginia Tech, which had been picked in the preseason to finish in last in the ACC this season, beat then-No. 1 North Carolina September 10 in a 1-0 double overtime thriller, alarms went off that the No. 1 Maryland Terrapins could not take the Hokies lightly this time around. Sure enough, the Terps did not come into Blacksburg too overconfident. After a frustrating 0-0 tie Tuesday at Seton Hall, Maryland got the ball to their top scorers early and often to create opportunities. While Virginia Tech goalie Kyle Renfro ultimately made eight saves, the Terrapins were able to find the back of the net twice to secure victory. John Stertzer headed in his sixth goal of the year in the 29th minute off a Kaoru Forbess free kick. In the 41st minute, Forbess sent a cross into the box that Casey Townsend netted for his ninth goal of the season to give the Terps a commanding 2-0 lead. Forbess now has three assists in the last four games after tallying just one in the first five matches of the year. Goalkeeper Will Swaim and Maryland’s backline were able to keep the Hokies off the scoreboard for their fifth shutout of the season as Maryland improved to 8-0-1 overall and 3-0-0 in the ACC. It is the first 3-0-0 start for the Terps in the ACC since 2003. The 49ers enter tonight’s game on a five-game winning streak. They have outscored their opponents 16-5 this season and have shutout their opponents four times in eight games. Charlotte boasts a very balanced scoring attack. Reigning Atlantic-10 Player of the Week Evan James leads the 49ers with four goals on the year. Jennings Rex is second on the team with three goals. Donnie Smith, Tyler Gibson and Isaac Caughrans have tallied two goals apiece. This game will mark the second meeting between the two schools. Maryland defeated Charlotte in 2008 in overtime by a score of 2-1. Over the last three seasons, the 49ers are 5-0-1 against the ACC, including a 2-0-0 record this year. Maryland is outscoring its opponents 25-6 this year. The Terps have allowed just one goal in the last three games. Of the six goals Maryland has allowed this season, five of them have come in the second half. Maryland is surrendering just 0.67 goals per contest. They have allowed only 21 shots on goal all season. The Terrapins are led on offense by Casey Townsend, who leads the team in both goals with nine and points with 18. Townsend had nine goals in all of 2010. John Stertzer is second on the Terps in scoring with six goals and three assists for 15 points. Patrick Mullins is third with five goals and one assist for 11 points. Sunny Jane leads Maryland in assists with five. The Terps have outshot their opponents 165-69 this year. This is Maryland’s sixth home game of the season. 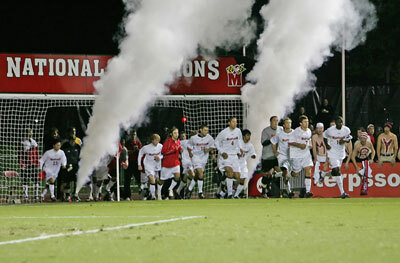 The Terps are averaging 4,643 fans per game at Ludwig Field in 2011. You can listen to the action live on WMUC Sports at 7:20. Luke Jackson and Pauly Kwestel will be on the call. This entry was posted on September 27, 2011 by Scott Kornberg. It was filed under Maryland Terrapins, Soccer and was tagged with Casey Townsend, Charlotte 49ers, Charlotte 49ers soccer, Charlotte soccer, Donnie Smith, Evan James, Isaac Caughrans, Jennings Rex, John Stertzer, Kaoru Forbess, Kyle Renfro, Maryland soccer, Maryland Terps soccer, Maryland Terrapins, Maryland Terrapins soccer, Patrick Mullins, Scott Kornberg, Sunny Jane, Terps soccer, Tyler Gibson, Will Swaim.